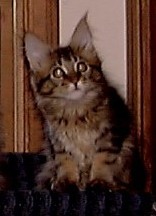 Eowyn is a brown classic tabby female, daughter of Hana and Wills. Like her littermates, she is named after a character from J.R.R. Tolkien's Lord of the Rings. Eowyn has stayed here with us and has become an important part of our breeding program. To see her "grown-up" page, click here. Eowyn is a beautiful girl with huge ears and large lynx tips. Her muzzle is well-defined, though she is going through a (hopefully brief) phase in which her muzzle is not quite long enough to balance her huge ears. She has a deep square chin and a very pretty profile: a clean gentle curve. 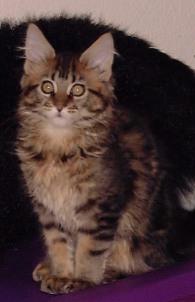 She is a warm brown tabby with an outstanding classic tabby pattern. Her body is lean and hard, and she is surprisingly heavy for her size. Her boning is pretty good for a girl her age; we are hoping she's going to be a good-sized girl. Eowyn is not as relaxed and outgoing as her brothers, though she does like people, and likes to be petted as long as it's on her terms. She is developing into an opinionated young lady, and has earned the nickname of "Miss Mouth" because she is so talkative. (Eowyn has something to say about almost everything.) If she notices someone else getting petted, she comes up, sits just beyond reach, and squeaks at us until we reach out to pet her, too.